You don't NEED the material on this page. You need to know about twin studies in general for the Biological Approach in Unit 1. They're also useful for discussing the biological explanation of mental disorders in Clinical Psychology (Unit 2). A question might ask you to "use research evidence" in which case you must know findings from this study; a question could also ask you to describe or evaluate "a twin study" (but it won't identify THIS study by name). REMEMBER you can always write about Brendgen et al. (2005) as your twin study. You are required to be able to describe, apply and evaluate a twin study. The Biological Contemporary Study by Brendgen et al. (2005) is a twin study. However, some students may be learning a different contemporary study. Moreover, Brendgen is quite complicated and students might like to learn a second, easier study in case they are examined on twin studies specifically. This twin study was carried out by Irving Gottesman (left) and James Shields in the 1960s. It was a key piece of research that established that there is a genetic component to the mental illness schizophrenia. It shows how scientific research proceeds, because Gottesman & Shields tested the hypothesis that there is a genetic component to schizophrenia by comparing MZ and DZ twins, where one twin had the illness. This has been replicated many times since. Schizophrenia is a mental illness that affects up to 1% of the UK population. It tends to appear in males in their teens and females in their 20s and 30s. Schizophrenia is a psychosis: it involves a break from reality and a breakdown of the personality. Sufferers may have minor symptoms for some time then suffer severe psychotic episodes where their behaviour becomes very bizarre. Psychologists used to think schizophrenia was learned and often blamed bad parenting. However, evidence has grown that there is a strong genetic component in schizophrenia. To find out if there is a genetic basis for schizophrenia. Also, to replicate previous twin studies into schizophrenia to test their reliability. In particular, the researcher looks for concordance rates in MZ twins where one suffered from schizophrenia and compared these to concordance rates in DZ twins to see if there was a significant difference which would be explained by genes. 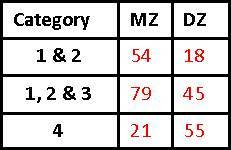 This is an independent groups design, since it looks at the difference between DZ twins and MZ twins. Because zygocity is a naturally-occurring variable, this is a natural experiment. The researcher's measured the concordance rate for pairs of twins in four different categories. 62 schizophrenic patients, half male, half female and all aged 19 to 64. All had been patients at a large London hospital between 1948 and 1964 and all had a twin. The researchers originally identified 68 but had to reduce this because some were now out of the country or else it was impossible to tell if they were MZ or DZ twins. 24 MZ twin pairs and 33 DZ twin pairs were identified. Wait, weren't there 62 patients? - this only adds up to 57! Yes, but there were 5 twin pairs already among the patients. These were 5 occasions where a patient and their twin had both been to the hospital to be treated for schizophrenia. This is why 62 patients turned into 57 twin pairs. This study is from the 1960s. In a modern twin study, zygocity would be checked with DNA testing and mental health could be checked with brain imaging, greatly improving the reliability. 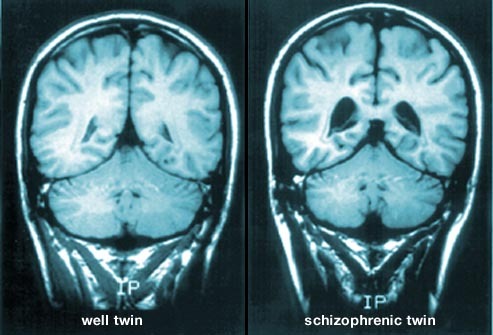 This MRI brain image shows the difference in structure between a person with schizophrenia and their healthy twin. The dark spaces are fluid-filled "ventricles" which are much larger in a schizophrenic brain. You can see that lots of twins shared mental health problems generally, but 55% of the DZ probands had a healthy twin, compared to only 21% of the MZ twins. 54% of the MZ probands had a twin with either schizophrenia or a related psychotic disorder. For severe schizophrenia (involving 2+ years in hospital), the concordance rate for MZ twins was 75%, but only 24% for DZ twins. In every category, there was a significant difference between MZ and DZ twins, with MZ twins being more likely to share a similar diagnosis of mental illness. The concordance was stronger for female twins than male twins and also stronger with more severe schizophrenia. There seems to be a genetic component to schizophrenia because the closer the genetic link, the more likely both twins are to show schizophrenic symptoms. However, the MZ concordance rate was significantly lower than 100%. This means that, despite their shared genotype, MZ twins do not always share schizophrenic symptoms - 21% of MZ twins with a schizophrenic brother or (less commonly) sister were perfectly healthy. This suggests that genetics is not the only cause of schizophrenia. Gottesman & Shields conclude that genes may predispose a person towards schizophrenia, but there needs to be an environmental trigger. This is called the diathesis-stress model (Rosenthal, 1963) and it takes into account nature and nurture. Gottesman & Shields also reviewed 11 earlier twin studies and concluded that the results all back up this conclusion. Gottesman & Shields certainly pioneered the theory that schizophrenia has a genetic component. This view is now mainstream in psychiatry. However, not everyone agrees. Critics argue that the evidence for Rosenthal's diathesis-stress model is not as strong as it appears. One of these critics is Jay Joseph, whose views are discussed in relation to the Kety et al. 's adoption study of schizophrenia. Critics point out that environment can lead to schizophrenia too: child abuse, neglect, bullying, drug and alcohol problems, all play a part. Often, if one twin suffers these things, the other one does too. However, there might be all sorts of reasons other than genes why one twin might "rise above" these difficulties but the other has a breakdown. For example, Gottesman & Shields use the proband technique. Out of their 62 probands, 10 were actually twins of each other, so there were only 57 twin-pairs in the study. By using the proband technique, Gottesman & Shields counted each of these 10 participants twice: once as a proband (with category 1 concordance with their twin) and once as a twin (with category 1 concordance with their proband). You can probably see that this approach increases the number of category 1 cases in the results, skewing the findings towards the conclusion that twins share mental illnesses. Critics like Joseph (2014) argue that twin studies prefer the proband technique because it makes them more likely to find strong concordances between twins, which is what they are looking for. If they used the pairwise technique, the concordance rate would drop. The debate over genetics and schizophrenia can get heated. It's part of a wider debate over heritability - whether important characteristics are inherited from your parents - that is part of the natture/nurture debate. This study has a fairly large sample and covers a range of ages, from teenagers to men and women in their 60s. There's a 50/50 mix of men and women and even a high proportion of 'rare' MZ twins in the study. However, the sample may not be representative. 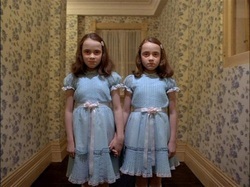 Besides the problem of twins being unusual people, these particular twins were particularly unusual. Many of them were admitted to hospital in the '40s and '50s after their experiences in WWII. Some of them had been prisoners of war (POWs). These traumatic experiences might have led to all sorts of lifelong problems, not just "ordinary" schizophrenia. Gottesman & Shields are deliberately replicating a twin study design carried out by 11 previous small-scale studies. This demonstrates reliability, especially because Gottesman & Shields got similar results. By modern standards, the procedures are not reliable. Without DNA testing, assigning zygocity by physical resemblance and fingerprints is not accurate. However, in the Brendgen et al. (2005) study, Brendgen assigned zygocity based on appearance then checked this with DNA testing and found it to be 94% accurate, which is quite high. If Gottesman & Shields were that accurate, then at most 2 or 3 twin pairs were mis-assigned, probably DZ twins being mis-assigned to MZ. In this case, the real difference between MZ and DZ twins might have been even greater than it appeared! There are reliability problems with diagnosing schizophrenia. In the 1950s and '60s, schizophrenia was diagnosed using the Diagnostic & Statistical Manual version I. DSM-I defined illnesses like schizophrenia in terms inspired by Freud's psychodynamic theory. In the 1980s, DSM-III changed to a more biologically-based diagnosis. The DSM is currently in its 5th edition (DSM-5), so the classification of schizophrenia has changed 4 times since Gottesman & Shields' did their study. There are important applications of this study for families with a history of schizophrenia and people with a schizophrenic brother or sister, especially a twin brother or sister. The people need to know they have a genetic predisposition to schizophrenia so that they can avoid triggers (like drug abuse or excessive alcohol, highly stressful professions, etc). Armed with this research, doctors can monitor "at-risk" patients for early symptoms that might go unnoticed. Like most mental illnesses, schizophrenia cannot be cured but its harmfulness can be reduced if it is recognised early. Gottesman & Shields' findings tie in with earlier research and Rosenthal's theory of the diathesis-stress model of schizophrenia. This gives their research concurrent validity (they agree with the previous studies) and construct validity (they agree with the theory). There are still vague and unclear concepts in this research. 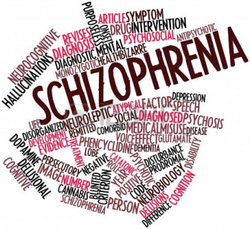 What do Gottesman & Shields mean by "psychotic disorders related to schizophrenia"? It sounds like a catch-all category that almost anything could fall into. If so, the findings that MZ probands have twins with disorders similar to schizophrenia might be an illusion. The twins' illnesses might be nothing to do with schizophrenia - for example, having to care for a mentally ill twin is stressful and depressing, but that doesn't necessarily make you schizophrenic too. The participants in this study were mostly adults who agreed to take part knowing what was being researched. The youngest participants were teenagers and may have needed parental consent, but parents were heavily involved in the research process so that was surely given. There are some concerns about obtaining consent from mentally ill participants who may not be competent to understand and agree to the research. However, parents and carers may give presumptive consent instead. This sort of research has a strong social responsibility to shed light on the causes of schizophrenia and perhaps help reduce the suffering it causes. In terms of risk assessment, the benefits are very high but the likelihood of harm is very low, so the research should go ahead. A 8-mark “evaluate” question awards 4 marks for describing a twin study (AO1) and 4 marks for evaluating it (AO3). You need a conclusion to get a mark in the top band (7-8 marks). 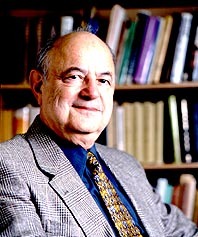 Gottesman & Shields investigated the genetic component in schizophrenia. The study had a representative sample because they recruited 61 patients with schizophrenia who had twins. Some of the twins also had schizophrenia, but others had less serious mental illnesses or were healthy. The main problem with this twin study is that how zygocity was assigned was unreliable. The researchers assigned zygocity based on blood type, fingerprint patterns and physical resemblance but this doesn't always distinguish MS and DZ twins. Another problem is diagnosing schizophrenia reliably. DSM-I used in the 1960s has been replaced by DSM-5 today and the old definitions of schizophrenia were shown to be too vague. Even if DSM-I was reliable, Gottesman & Shield have their own vague categories, like grouping twins suffering from "related psychotic disorders". It's not clear what this means or why twins were put into this category. In conclusion, because psychology has progressed over time, if Gottesman & Shields carried out their research today they could use DNA testing to improve the reliability. Brendgren et al. (2005) checked zygocity with DNA testing and found it to be 94% reliable. Notice that for a 8-mark answer you don’t have to include everything Gottesman & Shields did. But I have tried to make the two halves – Description and Evaluation – evenly balanced. Notice that I introduce the evaluation point first then follow it up with description/knowledge; I try to link the conclusion to an Issue/Debate (but this isn't compulsory).